The very first thing that was great about our day out as we parked up at Thruxton for the 2013 round of the British Touring Car Championship was that two chaps parked up next to us and each got a pram and then a toddler out and head off to the gates. This is really great to see for the benefit of motor sport’s future, not least the BTCC and the various formulae that support the championship. 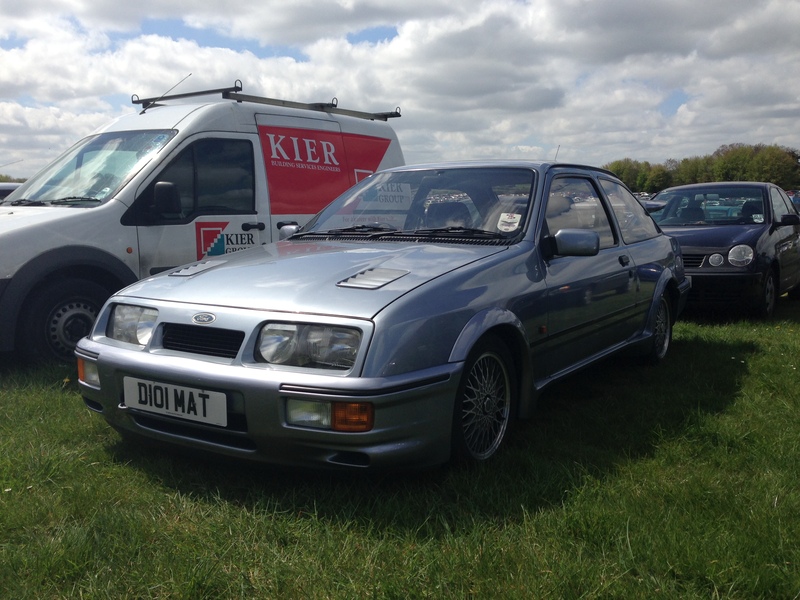 Race 1 was already under way and sounded like a swarm of bees across the car park as we walked over to the gates past, most notably, a fantastic Cosworth Sierra and a far less impressive 911 RS 4.0. 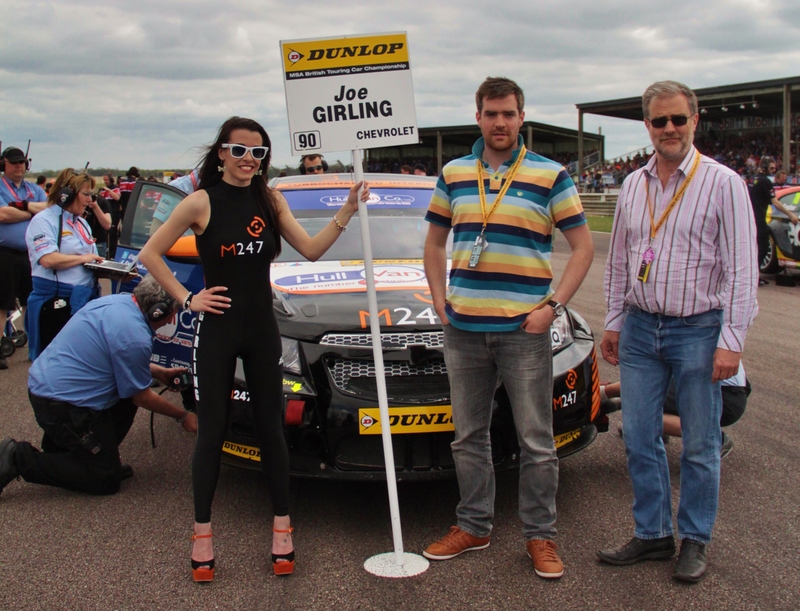 Chris Byrd of M247, our host for the day, welcomed us warmly at the gate and ticked off Thruxton on the guest passes as guests of M247 Racing on a superbly sunny Sunday. 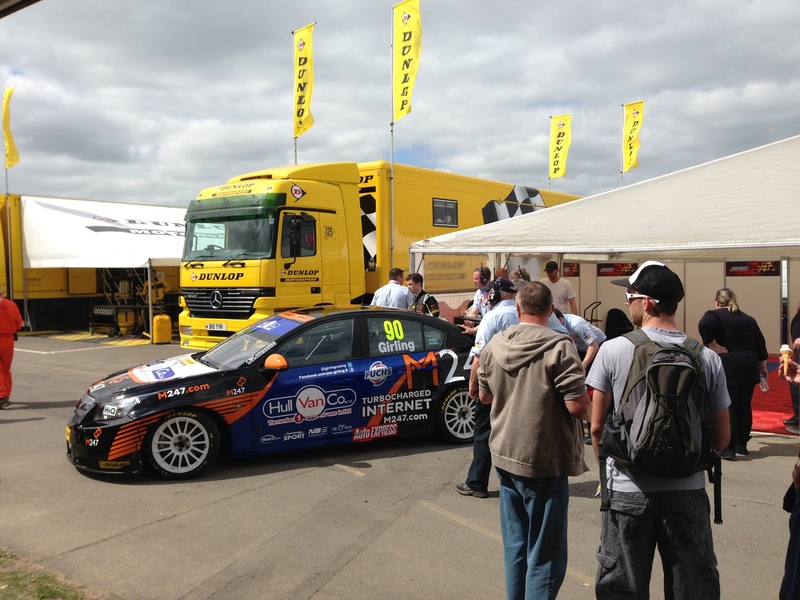 As we walked past the huge trailers and VIP areas of the BTCC sponsors, Chris described their setup as having an informal approach and, despite the fact that they take racing very seriously, they are very new as sponsors and having to learn quickly about the culture of racing from the few races of the season so far. 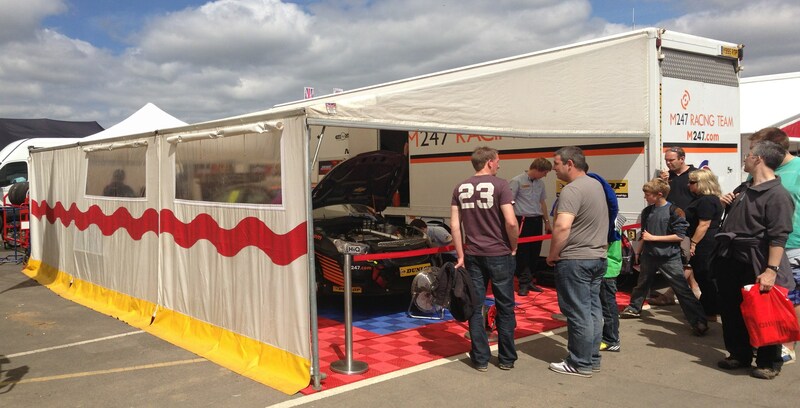 M247 Racing’s paddock spot was nice and neat. 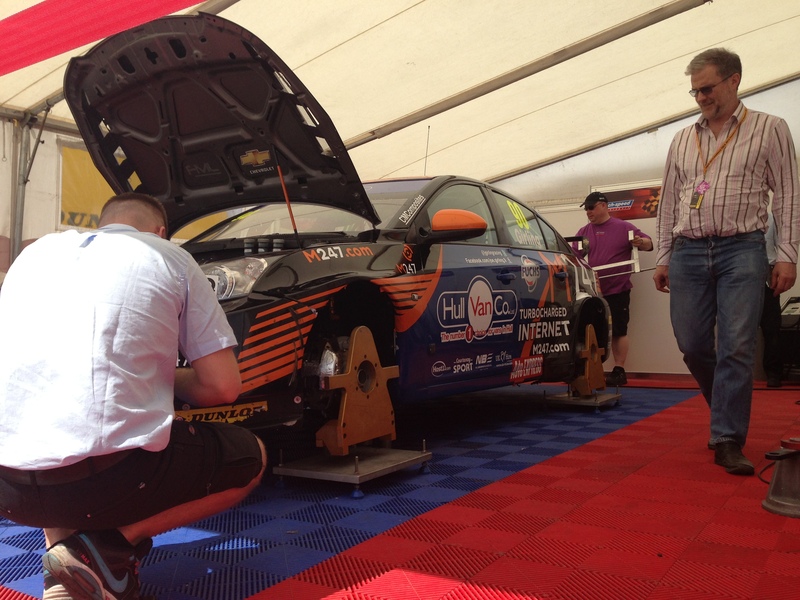 We arrived at the M247 garage where the Tech-Speed Motorsport team were hard at work on Joe Girling’s finely-liveried Chevrolet Cruze giving it a thorough looking-over after the first round. 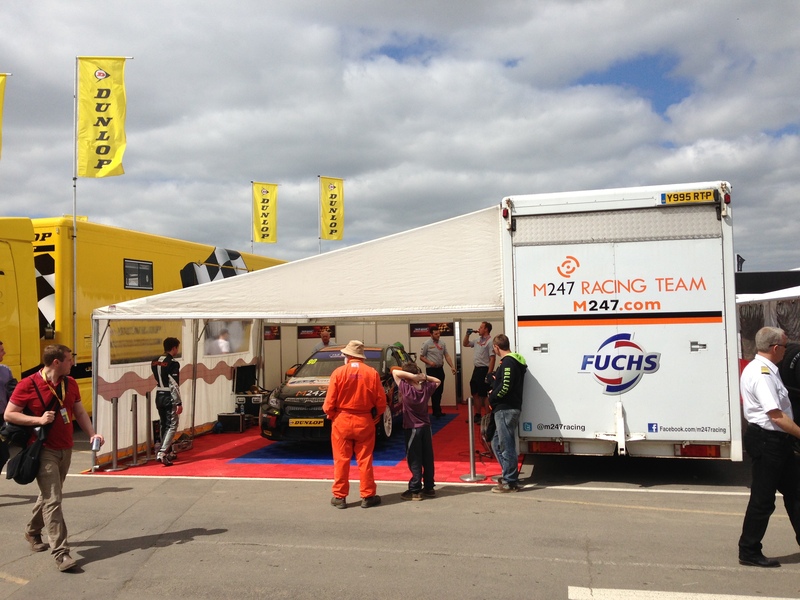 M247 Racing are competing in the Jack Sears Trophy which is currently aimed at giving access to the big BTCC show on a much smaller budget using previous seasons’ Super 2000-spec cars. We were gently warned against touching the geometry adjustment equipment so I trod gingerly. My Dad, however, did a good impression of someone deliberately taunting the engineers, while Mum enjoyed the free coffee from the Dunlop trailer opposite. Joe was obviously exasperated after a frustrating first session and did well to talk to us as we kept our banal questions to a minimum. I didn’t like to intrude on his discussions as he was clearly focused on what was going wrong and wanted to put it right, while his emotions kept things clear. We were welcomed in but I still felt in the way and wasn’t as bold as Dad who asked keen questions and kept the engineers on edge as he skirted the sensitive equipment! He was in his element, really. At the back of the pit area we were met and greeted by Christine and Matt Lyneham, photographer team and parents, who were immediately engaging and effortlessly concentrated on making us feel comfortable and less in-the-way. Their two young motor sport-obsessed daughters were also milling around but the atmosphere would have felt like a relaxed family gathering even without them. As a result the time flew until there was only time to get a burger and watch the Renault Clios roll through the pits having had a rare old time knocking each other around on track as usual. We found our friend Alex Morgan in an understandably foul mood following his race since he was suffering major effects from a small shunt at a more successful visit to Donington the week before. As the ever-entertaining Ginetta Juniors filed through the paddock we knew it was time to meet up with Christine who had offered to take us on to the grid. As we waited we noted that Joe and the team were the very first of the crews that didn’t have a main pit lane garage to arrive which impressed us, actually, but it worried Christine as she prefers him to be more on edge as he gets out on track. After a great chat and a few stories it’s clear that the Lynehams, Joe, Tech-Speed Motorsport and now M247 are a crucial part of a very large and close-knit motorsport family that goes beyond even the BTCC. The M247 Racing Chevy gets pushed up to the holding area. The klaxon sounded and the grid walk began! Treading the tarmac of Thruxton was a genuine thrill, knowing what history it holds, and despite it being brief, it was great to point out the big names to Mum as we walked past in front of the crowds. We got to Joe’s spot and the races are subject to such a quick turnaround that there was barely enough time to get the obligatory grid girl shot with yours truly looking spectacularly awkward (for no good reason) before the klaxon sounded again and we slid back to the infield to watch the race. We found a spot overlooking Allard and settled in to enjoy the spectacle of each car hitting the kerb and flying off up to and around Campbell, literally on the edge of adhesion at the fastest track on the BTCC calendar. Mum passed the time by keeping track of the Airwaves cars and noting which had got into trouble since last we saw them and timing the gaps between Joe and his nearest competitor. Joe’s car was clearly struggling on the new geometry but we decided this wasn’t something he could blame himself for given his fine performance in the first round. At the end of the race we returned to the pits and had to keep track of Mum who was busy declaring “oh, it’ll just knock out” as she disappeared off to watch Dan Welch’s Proton be dragged off the back of the recovery truck. This was following a specatular shunt that almost claimed photographer Matt who recalled the tale in modest terms relative to the dangerous situation he was very recently in. You can see him on the BTCC coverage simply going ‘over there’ as Welch careened towards Matt’s vantage point. After another free cup of tea and a chat back at the paddock I disappeared off to watch Dan Cammish win his 9th race out of 9 in the Formula Ford championship this time by a huge 7 seconds over 2nd place which is remarkable for such a fast track. As I stood there a grumpy old man complained that “it’s not worth watching” and wandered off which was a shame as little did he know he was watching a rising star of British motorsport. The Ginetta Juniors did battle once more and the Porsche Carrera Cup thundered around impressively while Dad and I took a trip around the infield nosing in on garages. 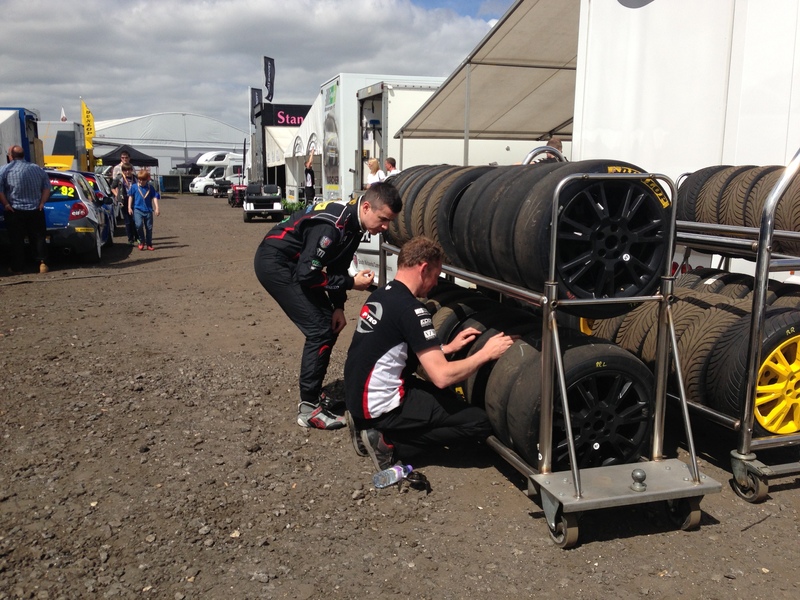 We returned to the M247 paddock and found tyres being scrubbed of detritus, a reset of the suspension geometry to Round 1 spec, Tech-Speed’s head mechanic inspecting the cylinders and re-fitting the injection unit, and some lunch on offer. I stood with Chris and photographer Arron Green and chatted variously about race results, expectations, M247’s last-minute involvement in a sport they weren’t sure suited them, pending sunburn and cups of tea. As the third round approached we went to watch the Porsches return to the paddock and the Jack Sears Trophy guys line up to go back out while planning where to sit on the other side of the track for the final round. As the grid lined up we set off to find a spot on the bank with a great view of the start-finish line up to Campbell, arriving and settling just in time for the lights to go out and have them thunder past at full throttle. Perfect. The atmosphere on the hill was great, with the young kids mucking around, grown kids cheering on and enjoying the cars thrashing each other to bits and the guys on track having a great time. It was really something to watch the Hondas of Gordon Shedden and Matt Neal seemingly easily scything through the pack to take the 1-2 and make it three wins in three races on one day. You may have noticed that this hasn’t been a race report, and for very good reason – I didn’t see much of the racing! If you’re at home then you can follow everything and get a great picture but when you’re there, in the absence of lots of large screens and a decent PA system on the infield, the day is more about getting involved with the paddock while chatting to mechanics and racers. It really was a great pleasure to be the guests of M247 Racing for the day and to briefly become a part of such a committed family with petrol in their veins for a day. Our gratitude goes out to Paul Sillars and Chris Byrd of M247 Racing for the invitation and hospitality respectively, to Matt and Christine Lynham for being so wonderfully open and generous, and of course to Joe Girling for putting up with us getting in the way. Here’s to a great season for you all! M247 can rest assured – they made a good decision to get into racing.